Have you ever accidentally deleted photos from computer? You know that it can be incredibly frustrating. And it is even more frustrating when they happen to be your precious family photos, design drawing or vacation pictures. Fortunately, deleting images may not be the end of world. In most cases, these pictures are still hiding in the Recycle Bin and can be easily retrieved. If your photos are not in the Trashcan, RePicvid is your best bet to recover deleted pictures from computer. Just double-click on the Recycle Bin(Windows) or trashcan (Mac) and you can see everything that’s inside. Found the pics you had deleted? Right-click on an image to restore or simply drag it back onto the desktop. Didn’t find the images you want in the trashcan? Never give up! RePicvid Free Photo Recovery Software is highly recommended to you. It is free yet powerful to restore deleted photos from computer even if you emptied the Recycle Bin. Just download and install it on computer to get back deleted photos. 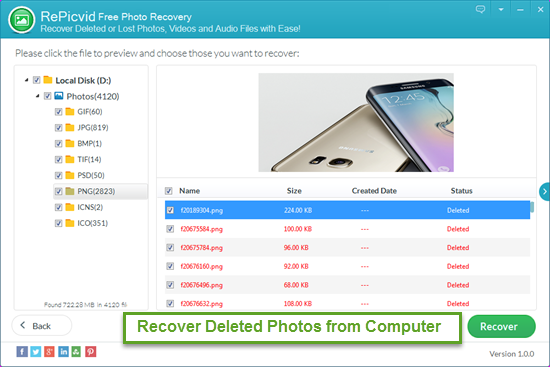 Open RePicvid and click on Photo Recovery opition, then you will see a list of all your disks on the interface. 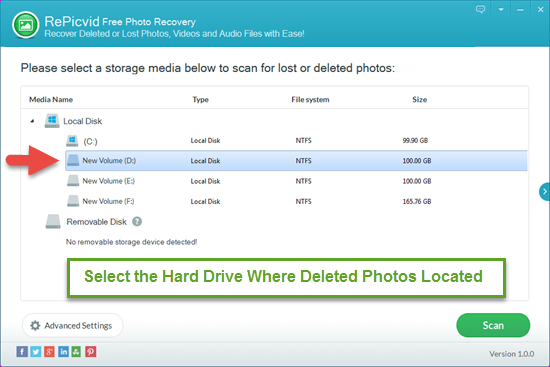 Just select your desired disk where your lost photos located. Note: Stop copying or creating new files in the hard drive, as there is a chance that newly created data will overwrite the deleted/corrupted files when using the disk. Click the “Advanced Settings” to select the photo types for faster scanning, such as JPG/JPEG, PNG, GIF, ICO, PSD (Photoshop), PCX (Paintbrush). If you are unaware of the types of lost images, just click on “Scan”. The scanning will take a few minutes. After the scanning process, all recoverable photos will be listed in type categories. You can preview them in details and check those images you want. Finally, click “Recover” button to save them to another folder location on computer. 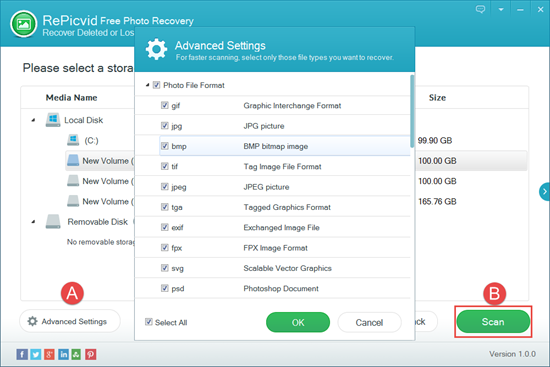 After those steps finished, all your deleted or lost images will be completely recovered and saved at the folder location. Open the folder, you will see the deleted photos again. In addition, RePicvid full version also helps to restore deleted or lost videos and audio files from computer.